Dr. Rodney R. Million is a pioneer in radiation oncology and a true innovator combining technology with research to improve the quality of cancer care in the US and abroad. Before retirement, he was a champion of treating patients undergoing cancer treatment with dignity regardless of their ability to pay. He understood the value of clinical research to reduce mortality and improve the quality of lives for those with cancer. 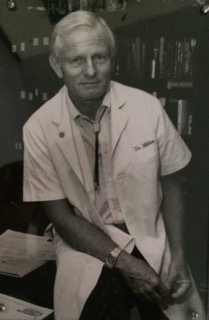 This photo of Dr. Million shows him wearing the same style lab coat worn by Gilbert Fletcher. Rodney deemed it practical and was immediately recognized in this iconic “style”. Globally, cancer is a growing and progressively urgent problem from medical, health system, business, workforce, economic and ethical perspectives. Increasingly, the case burdens are increasing in Low- and Middle-Income Countries (LMIC) and also in rural underserved areas in resource-rich countries, and by various measures outcomes are significantly worse than in high-income countries and regions. The Million family, along with the International Cancer Expert Corps, established the Rodney R. Million fund for innovation in clinical care to provide financial assistance for travel to trainees or health care providers working in the field of radiation oncology. Applicants should focus on LMICs where the trainee can interact with expert cancer care providers to learn new skill sets acquired from academic training programs in the US, create an interactive research project which will contribute to improving cancer care in LMIC or explore the development of innovative technology that can be used in cancer care for patients in LMIC. In honor of Rodney’s transformational and innovative career, the recipients of the travel fund award will, at the end of their tour, be able to demonstrate that they provided a new skill set to the oncology team in cancer clinics and other areas within Low- and Middle-Income Countries worldwide. The skill set taught should reflect an improvement in the quality of care and quality of life for cancer patients undergoing treatment. Working with and supporting these leaders of the next generation, the Million fund, through ICEC, will help sustain careers and other related activities in global health and service to these struggling countries and other areas. This photo of Dr. Million’s family was taken in California on April 30, 2016. 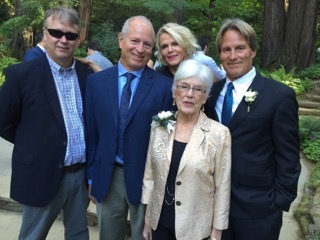 Marge Million, his wife of over 55 years, in front, and left to right; Steve, Brad, Lynn and Jeff Million. Though Rod doesn’t travel too much, he enjoys his children and grandchildren immensely. 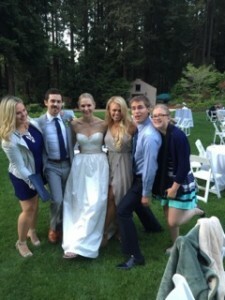 Rod has 6 grandchildren – 5 of them seen here from left to right; Shelby, groom, Emily (bride), Kristy, John and Caroline (missing is Jack 8 years old). Wonderful opportunity for the family to get together. Interested trainees or healthcare providers should first complete and submit the application form to become an ICEC Expert available on the ICEC’s website. Please note your interest in applying for the Million Fund on the form. Questions or other inquiries about the fund should be directed to ICEC at development@iceccancer.org. To contribute to the Million Fund to support trainees and healthcare providers or go to our Donate Now page.